Erin O’Grady has proudly served as a Paramedic at REACT EMS since April 2012. 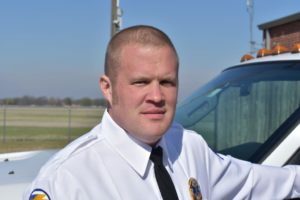 A Westminster, Colorado native, he completed his EMT-Basic and Paramedic training at Gordon Cooper Technology Center after moving to Shawnee. REACT has implemented a sole-Paramedic Response unit in a large, remote portion of their response area. Erin expressed interest and was selected as his primary assignment. Erin is deeply committed to his patients. He finds the most rewarding part of his job to be the opportunity he has “to care for patients when they are having what may be the worst day they have ever experienced.” This is especially important to Erin as he has elected to work in REACT’s South County unit, which encompasses his own neighborhood. He notes that while it is harder than he imagined to respond to calls for people he personally knows, he values deeply the trust they place in his skills. One of Erin’s most memorable moments at REACT took place when he was called to care for an eight-year-old girl who had been stung repeatedly by wasps. The young patient was in full anaphylaxis, with hives and respiratory distress. Erin worked quickly and very effectively to stabilize her breathing and reaction while the transport unit responded from so far away. The young patient was fortunate that Erin was close, knowledgeable and skillful. In addition to serving patients with dedication, Erin works to build strong relationships with REACT’s partners in the remote area it serves. He has worked to meet with volunteer fire fighters and others to improve their knowledge and responses to medical emergencies. As he looks to the future, Erin plans to continue to build upon REACT’s already-stellar relationship with the public. He will do so through the continuation of our program offering routine health checks for senior citizens, in addition to new and ongoing initiatives to educate citizens about the importance of CPR and the Stop the Bleed program. When not at work, Erin enjoys spending time with his wife, Shantel, a schoolteacher, as well and his children Ewan, Brennen, and Keira. With his thoughtful and compassionate dedication, Erin is a leader and role model for his peers and his community. REACT is proud to recognize Erin O’Grady as a 2018 Star of Life.